One of many older screenshots. 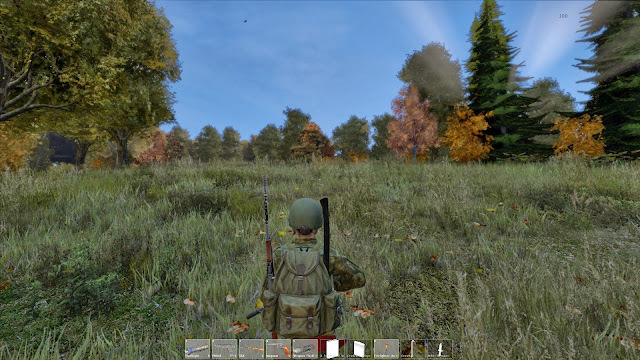 With .60 on the way soon, these screenshots are a great reminder of how far DayZ has come. Video games have been around for a while. From a design perspective, video games should have a very specific set of design principles by now. Surely enough market data and research has been compiled to tell us for certain what makes a good game. And yet, no such foundational document exists. Video games continue to expand and contract within and out of the fragile genre walls established in their early years. Two different games may have nigh identical design layouts and be vastly disparate in sales and popularity. What we do have is a handful of loose principles based on trial and error, human psychology and philosophy. Jesse Schell calls these principles "lenses" in The Art of Game Design. There is no magical combination of lenses that will guarantee a blockbuster title, nor any that ensure failure. Video games have, so far, defied uniform classification. There is one nearly constant factor that has emerged over the years. Concessions have always been made for the player. What started from a lack of technology has become a crutch trumpeted as player accessibility. Common sense knowledge and precautions we take in every day life have been limited or left out of video games. Clean your weapons regularly to help prolong their life and maintain accuracy. I've been perusing the DayZ bug reporting site and subreddit almost daily. In many games, a dead of dying player can be revived by defibrillator. The same was possible in DayZ until recently. 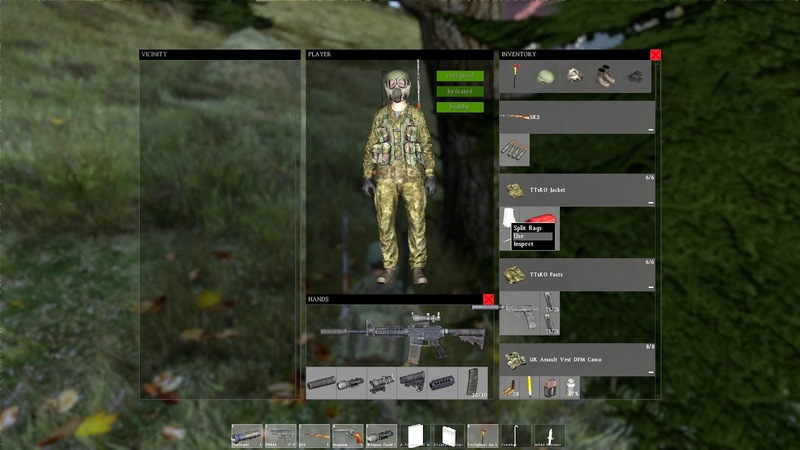 The latest experimental build has added irregular pulses and heart attacks to the game. With this addition, the defibrillator no longer cures a wounded player, nor revives an unconscious player. Players have been advised to check a downed player's pulse before using such a device to revive them. In a heated debate on twitter, Dean Hall assured players that this was the true use of a defibrillator, and that it would not be used as a magic electric resurrection machine. Taking even a moment to think about the issue in a realistic context defeats possibility. One would never suggest that an hours dead person, or a person that was shot and bleeding out could or should be revived with electrical paddles to the heart. Weather and rain were another recent addition. Rain now makes players and their equipment wet, an incredible concept. Some gear can be ruined by getting wet, and care should be taken to not stay out in a storm for too long. 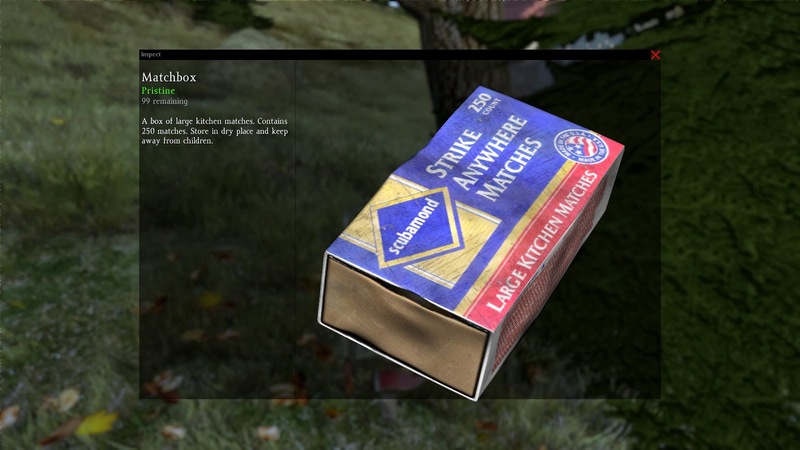 Lightning strikes are real things in DayZ, and while reports of lightning strikes killing players are unconfirmed, the outrage of the players who claim to have experienced it are hilarious. Why should they expect any possibility of being struck by lightning? They were only running through an open field, wielding a large fire axe in the middle of a thunderstorm, after all. Water is bad for these. I had my own moment of player disconnect a few days ago. I my character's infancy, she was attacked and nearly killed by a zombie (even though they're technically "infected" instead of zombies). I cleaned the wound and bandaged it. Thinking like a player, I assumed the injury was now taken care of and would need no further attention. After a while, I still hadn't healed completely despite being well fed and hydrated. Completely by accident, I ended up using the alcohol again. I got a message saying my wound felt cleaner. Face in palm, I realized I hadn't changed my bandage in days and my wound was getting infected. I rebound it with a fresh bandage, changed it again the next day and soon I was back at full health. Ever had a bad cut? How often did you change the dressing? All of these little things are fascinating tidbits. All of it really leads me to ask why these things are such alien ideas in game, yet common sense in our real day to day? We are at a point where the technology available to us can create fantastically realistic worlds and environments, but designers cling to the idea that players won't stay with something "too" realistic. So they implement a few concessions here and there. Falls hurt but won't break limbs, You can cure gunshot wounds with a syringe of mysterious fluid. Your buddy that stepped on a mine can be brought back to the fight with a quick charge from the defibrillator. Rain affects nothing but the ambiance of the battlefield. Bullet trajectories are magically straight over great distances, infections and disease are non-existent. No matter how many times you reload your gun, as long as you have ammo you always have another magazine. I could keep going, but by now I've tired the point. Realism in games is important to a lot of players. DayZ is one of a handful of games breaking out of decades old ruts by challenging what players have come to expect. 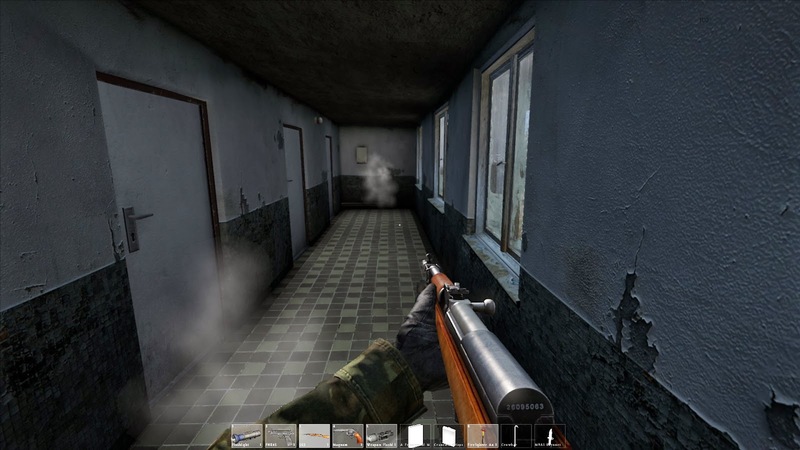 DayZ takes it's players out of their comfort zone by making so few concessions in the name of playability. We players have been coddled for far too long; there is an entire generation of gamers that have been raised on games that refuse to let them fail. Quickly regenerating health, frequent checkpoints, unlimited lives and self populating hints are a too common a sight in today's AAA game market. It's time we shook things up a bit. Tell your favorite developers you want more realistic, difficult games or at least the option for more unforgiving experience. Play games that force you to break with your expectations. Challenge yourself to think like a person instead of a player.